Unsurprisingly, this category contains shots of people. I must have processed this shot at least ten times since I shot it back in April of this year, and up until today I couldn't come up with a version I liked. This one I'm happy with. 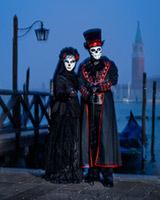 I'm now back in the UK after a great week running our 2016 Venice Carnival Photo Tour. It was a 14 hour trip to get home, so I won't write much now, but I do want to say that this is definitely one of my favourite shots from the whole tour: taken at Ponte dell'Accademia a couple of days ago. This is the first of two related images that were taken during my Shoot the Street workshop at this years GPP event. Both were shot at the same spot - the plastic curtains that divide the fish market from the meat section - and of the two I prefer the one I'll be posting tomorrow: it's less abstract, but has a surreal quality that I like. One of the things I like most about the Middle East is that the people, for the most part, are genuinely friendly and open to being photographed: stick a camera in their face, even when they're busy or distracted, and they'll smile. Some of the time I think this is down to the inherent politeness of the region, but most of the time they're interested and open because you're interested in them. As for this shot: it was taken during my Shoot the Street workshop at the recent Gulf Photo Plus.​ training event in March. The third and final shot in this small series, and one that may be a bit difficult to work out if you haven't seen either of the other two.